As of the census of 2000, there were 18,648 people, 7,324 households, and 5,309 families residing in the county. The population density was 33 per square mile (13/km2). There were 9,890 housing units at an average density of 17 per square mile (6.6/km2). The racial makeup of the county was 95.84% White, 2.86% Black or African American, 0.23% Native American, 0.08% Asian, 0.02% Pacific Islander, 0.09% from other races, and 0.90% from two or more races. 0.72% of the population were Hispanic or Latino of any race. In the county the population was spread out with 24.90% under the age of 18, 8.20% from 18 to 24, 26.70% from 25 to 44, 26.00% from 45 to 64, and 14.20% who were 65 years of age or older. The median age was 38 years. For every 100 females there were 98.60 males. For every 100 females age 18 and over, there were 96.30 males. 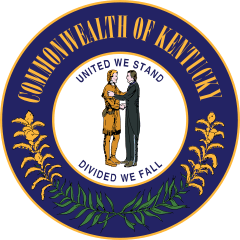 1 2 "State & County QuickFacts". United States Census Bureau. Retrieved March 5, 2014. ↑ "Find a County". National Association of Counties. Archived from the original on 2011-06-15. Retrieved 2011-06-07. ↑ The Register of the Kentucky State Historical Society, Volume 1. Kentucky State Historical Society. 1903. p. 34. ↑ "Brekinridge County". The Kentucky Encyclopedia. 2000. Retrieved August 20, 2014. 1 2 Jolly, Henry C. 1902, April 25. "Interesting History of Indian Bill Hardin". The Breckinridge Democrat. ↑ Collins, Lewis (1882). Collins' Historical Sketches of Kentucky: History of Kentucky, Volume 2. Collins & Company. p. 26. ↑ Breckinridge Bicentennial Committee Program. Accessed from Breckinridge Historical Archives. 1 2 3 4 5 6 Gregory, Edward. (1938). "At the End of the Trail: The Story of the Journey of Thomas Lincoln and His Family Through Hardin and Breckinridge Counties, Kentucky, to Indiana in 1816." Retrieved on November 27, 2014 from https://archive.org/details/atendoftrailstor00brec. ↑ Kentucky Historical Marker No. 1003. ↑ Kentucky Historical Marker No. 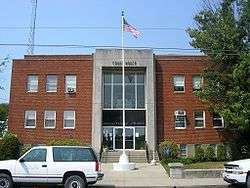 1003, Thompson, William, History and Legend of Breckinridge County, Kentucky. ↑ Kentucky Historical Marker No. 73. ↑ Kentucky Historical Marker No. 536. ↑ Kentucky Historical Marker No. 540. ↑ "2010 Census Gazetteer Files". United States Census Bureau. August 22, 2012. Retrieved August 12, 2014. ↑ "U.S. Decennial Census". United States Census Bureau. Archived from the original on May 11, 2015. Retrieved August 12, 2014. ↑ "Historical Census Browser". University of Virginia Library. Retrieved August 12, 2014. ↑ "Population of Counties by Decennial Census: 1900 to 1990". United States Census Bureau. Retrieved August 12, 2014. ↑ "Census 2000 PHC-T-4. Ranking Tables for Counties: 1990 and 2000" (PDF). United States Census Bureau. Retrieved August 12, 2014. 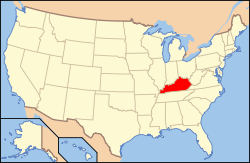 Wikimedia Commons has media related to Breckinridge County, Kentucky.